Every time I have to do it, I hate it. When my student has to walk the halls to cool down from a conflict with me, I feel like a first-year teacher again. A middle/high school student again. 13 years into my career and it still feels the same way. Let me tell you how it usually happens. The student(s) in question enters class as my ‘Good afternoon’ greeting signals the start of class. Then, because I am a career middle/high school teacher leader, t he students start talking. They talk when I give directions and when I don’t. When I use proximity control. When I won’t. The chatter gathers like smoke until it covers the class. At this point, I take offense and look for the fire, because where there’s smoke – there are (usually) students. When I find the culprit, we become parts of a power struggle that I do not intend to lose. I don’t. Eventually I ask the offender to leave the classroom. I do not make a habit of asking students to leave my class, but every time I do - I feel a familiar pain. Maybe because I was mischievous in school. I would sit right on a teacher's’ nerve and pluck it like a string until I was whistling by myself on the way to an administrator. This tune did not change until I was a couple of years away from getting my diploma. When I got put out, I was afraid because my dad would find out, but I also felt isolation. Scientists have said that the feeling of being left out is psychologically registered in the brain like physical pain. I felt that. Every time. Being blessed with parents who raised me well, I never offended to the point of making teachers my eternal enemies, but what about those students just like me who never re-acclimate to school culture? Or are blessed with parents who understand and communicate the expectations of school culture (read: Middle class)? It starts with being sent out, and sometimes ends in suspension. Or expulsion. Or (years later, in a different context) worse. To be clear, students bear the weight of their decisions – every iPhone stands on its on charger – but what will be the result of our decisions to separate students from classes? When I leave school to go home, I often see an older man who just sits on the broken part of a guard-rail next to the street. Cars crawl by during rush hour, but he is too tired to even beg for change anymore. He just sits. Put out. Like the trash. I wonder: When was he first put out? Where was he first put out? Will he ever come back? Who will be there for him when he returns? As teachers, we are faced with hundreds of daily decisions related to students and classroom management, and we will have days where we have to send a student out of the classroom. 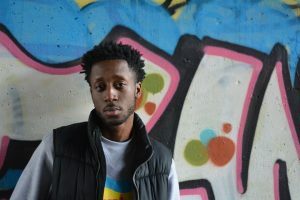 What we all must grapple with in a very real way, and what I am still thinking about in my practice, is if the type of student being consistently sent out is black or brown and male or female. Further, what relationship with authority are we establishing with them? When trust and decorum are breached, our actions either educate or alienate. The offenders in today’s classroom could grow to be tomorrow’s offenders in public. 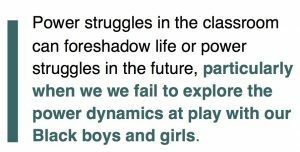 Power struggles in the classroom can foreshadow life or power struggles in the future, particularly when we fail to explore the power dynamics at play with our Black boys and girls. What’s more, we have to deeply reflect on our practices when students look exiled, even while in class. The answers to these questions may not just improve our practice and keep more students engaged with quality instruction, they may save their very lives. Josh Parker is the 2012 Maryland State Teacher of the Year and a member of Board of Directors for the National Network of State Teachers of the Year. He currently serves as an instructional coach for the District of Columbia Pubic Schools. He will be presenting at NNSTOY’s national teacher leadership conference July 14-19 in Washington, D.C. Source: Image from Pixabay by Unsplash licensed under Creative Commons.